Crowns typically take a few weeks to be made at a dental lab before being placed into the smile. Summerside Dental, however, provides crowns within a single dental visit after receiving necessary procedures. These crowns are made using porcelain materials using CEREC®, which is an in-office CAD/CAM device. Fully-customized and designed to look natural, these crowns help restore patients full dental function. Dr. Boldt is our Edmonton dentist who strives to improve her patient’s dental experience with technology. To cut down on the number of visits needed to receive efficient dental crowns, call Summerside Dental. How Does CEREC Improve My Care? Besides potentially cutting down on the number of appointments required for certain treatments, patients also gain a beautiful and functional restoration. 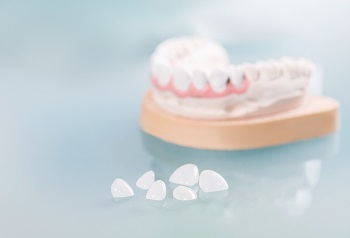 Dental porcelain is growing to be the standard material for crowns, and our CEREC machine uses strong compressed porcelain to make crowns. Additionally, the machine creates them according to individual specifications and addresses the unique structural needs each patient requires. Since the machine is in-office, it allows us to better tailor the fit and look of the crown, providing efficient customization. Before decay removal can be completed, patients undergo an initial examination. This allows our dental team to develop a treatment plan and take any necessary radiographs to plan for when the crown is fabricated. When the actual treatment is complete, digital impressions via digital camera images will be taken from the patient’s smile, which skips the process of placing a temporary crown. As soon as the crown is complete, it is placed and the fit finalized for a uniform appearance next to existing teeth. Then, patients are sent on their way with care instructions to support the health of their teeth and new crown. CEREC is equipped to fashion other restorations, such as inlays, or cosmetic improvements, such as veneers. This capability grants a spectrum of care options to patients who may not need full crowns or those who are looking to mask stains or spacing issues. Depending on our patients’ oral health, dental needs, and smile goals, our dentists can use CEREC to provide the custom restorative or cosmetic treatments may need. To see if our practice can help your smile with cutting-edge CEREC technology, call us today. We strive to improve the quality and efficiency of your care when possible.